Blade height (at heel): 1.33 in. 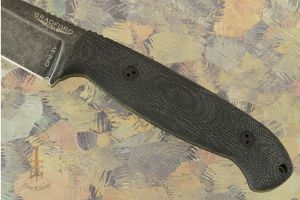 Description: Bradford knives are made in the Pacific Northwest. Brad Larkin's background working in an aerospace machine shop is clearly evident in these high performance knives. 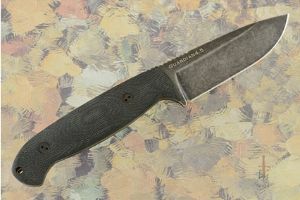 The Guardian 4.5 is the newest addition to his lineup of high performance outdoor knives. 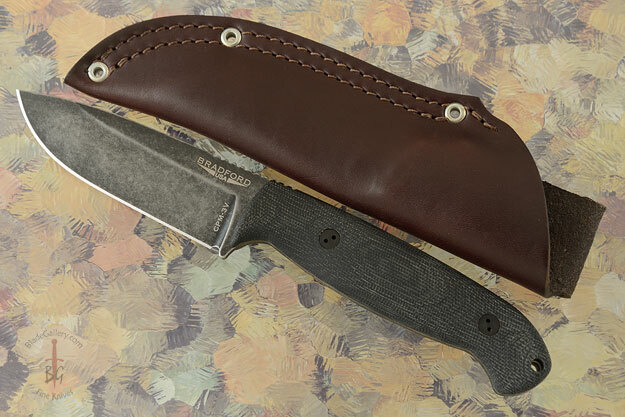 The Guardian 4.5 is a heavy duty bushcrafting blade based on the Guardian 4, but with a longer handle and a choil-less design. The new handle design accommodates more grip options for a larger variety of tasks. The blade is made from CPM-3V carbon steel, providing maximum resistance to breakage and chipping in a high wear-resistant steel. The blade has a nimbus finish, a tumbled DLC coating which helps hide scratches and adds a cool look. The Sabre ground blade has been double tempered and cryo treated providing maximum edge retention. The scales are formed from black micarta. The handle is 3D machined for a contoured grip and offers plenty of comfortable grip options. The micarta scales are set on a full tang for strength and durability. A hole at the end of the handle makes it easy to add a lanyard. 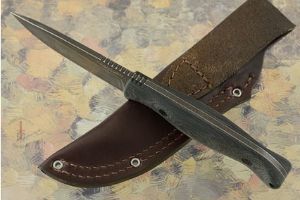 Each knife includes a premium pouch style leather sheath with belt loop. 0.0302734375 0.0302734375 30.2734375 30.2734375 Header Started. 0.140625 0.046875 140.625 46.875 Trailer Started. 0.2333984375 0.0927734375 233.3984375 92.7734375 Trailer Completed.